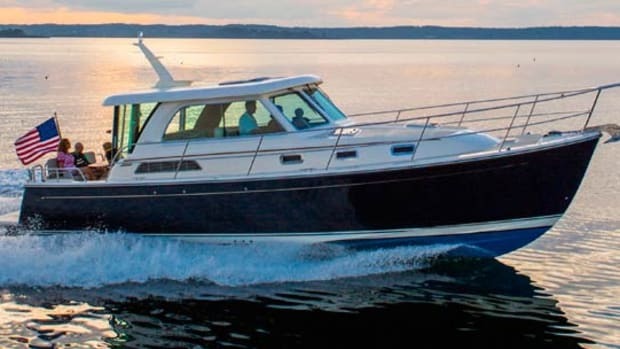 Bringing a Back Cove Downeast 37 from Maine to Newport, Rhode Island, in late summer may seem like a great cruising opportunity. But for contributor Eric Sorensen it was so much more, as he saw an opportunity to show his family some of his old haunts from the water. 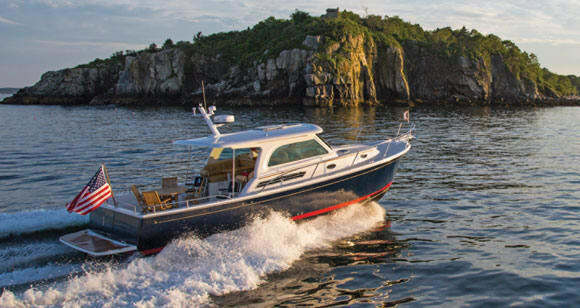 My family and I recently had the use of Back Cove’s new Downeast 37, the Maine builder’s fresh take on its original 37. We ran the boat from Portland, Maine, to Newport, Rhode Island, for the boat show last September, with leisurely stops along the way in Kennebunkport, Maine, and North Weymouth, Plymouth, and Falmouth, Massachusetts. 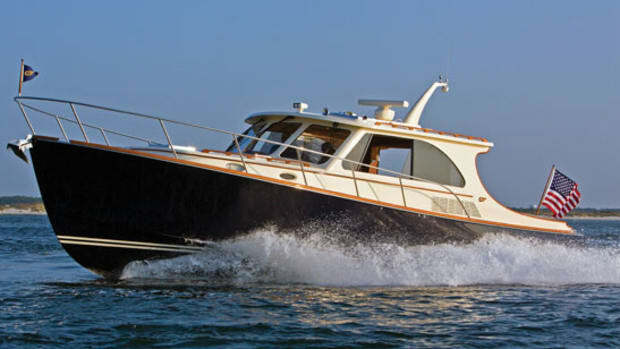 The Downeast 37 is a large and capable dayboat built on the same hull as the original Back Cove 37, only with a larger cockpit that’s flush with the pilothouse deck and a smaller cabin and pilothouse. 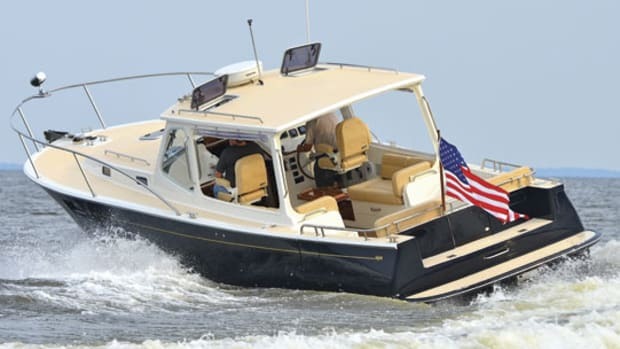 It’s what used to be called a sedan cruiser, and its proportions are much like those of the charter fishing boats you see plying New England waters. 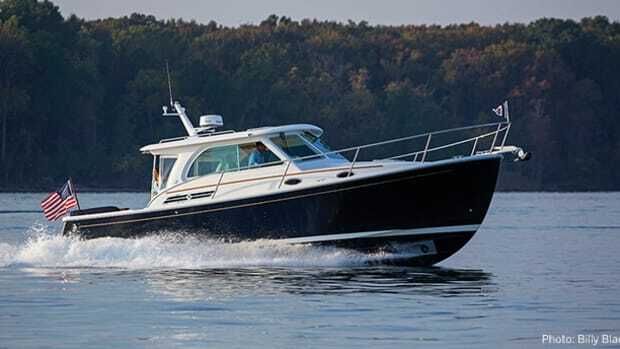 The Back Cove’s low profile and a waterline beam proportional to her waterline length are moderate in every sense. This creates a boat that is indeed beautiful to behold but also consummately seakindly and seaworthy. An important distinction between the Back Cove and a real lobster boat is its hull form. The Back Cove 37 has no keel, so it heels into a turn, and her deadrise aft creates the directional stability provided by the lobster boat’s keel. She has hard chines that not only break water and spray away from the hull to make it faster and drier, but also add lifting surface outboard in the hull for improved efficiency. The Back Cove won’t cruise at 30 knots, but she’s a faster boat than others because she can actually cruise with her bow down at any speed you like, fully and efficiently on plane, from 12 to 23 knots when the waves pile up. The Back Cove 37 has a moderately fine entry—her footprint at the waterline is sharp, rather than blunt—and this produces a very good ride in a head sea by attenuating wave-impact energy more gradually, which we feel as a smoother, lower-G ride. This was good because the wind on our September New England outing blew almost constantly between 10 and 20 knots. On the first day, from Portland to Kennebunkport via Casco Bay, northeasterly winds provided us with a steady 3- to 4-foot following sea. Two compelling arguments for inboard power over pods are the bulletproof simplicity of the shaft, strut, prop, and rudder drivetrain; and the comparable or superior efficiency at speeds below 22 or 23 knots: The added drag of the running gear just doesn’t start to kick in with significance until you get into the high-20-knot range. That’s when pods and stern drives come into their own with their slippery lower units. Plymouth Harbor is much like the tidal harbors I grew up around on Cape Cod. Eight- to 12-foot tides twice a day do a lot of scouring, so the channels are always shifting position, sometimes a little over a month or two, sometimes a lot in the course of one storm. So paying attention to the sandbars, as well as the buoys, is the only way to go. Fortunately, a grounding, especially a light one, can be close to a non-event if you have a skeg or keel protecting the running gear, but on most boats it’s easy to bend a blade on the prop or fold the rudder stock over if you’re going fast enough. When operating in daylight, though, it’s easy to see the bars if the sun is at the right angle. Plymouth Harbor is very well marked, and the buoys were on station during our visit, so no problems there. If you can time your arrival for a half tide at flood you can soon float off if you do happen to ground lightly. The Mayflower replica, Brewer’s marina, Plymouth Rock, beaches, and waterfront restaurants all beckon, as does Duxbury a few miles to the north. The cabin on the Downeast 37 sleeps two on an island berth forward. There’s an enclosed head with a separate shower to starboard and a galley opposite with a large countertop, microwave and drawer freezer, and refrigerator. One large and two small hatches overhead and side ports let in sunlight and fresh air. The cabin is also quite comfortable, with large proportions. Headroom at the companionway, for instance, is 78 inches (5 or 6 inches more than some boats of this size), and it increases just forward. Large, safe steps and a handrail lead out of the cabin and up to the pilothouse. This area is open to the cockpit, keeping with Back Cove’s mission of making the Downeast 37 a dayboat for entertaining. 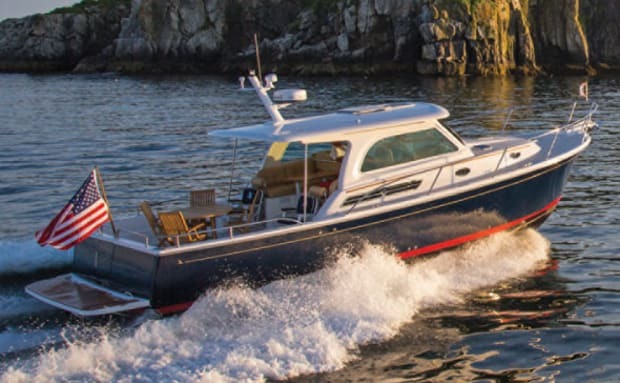 To port in the pilothouse is a convertible seat module that lets you face forward or aft and a dinette aft with an adjustable table that converts the settee to a double berth. The helm is to starboard, and there’s plenty of room for an electronics display or two on an angled flat that’s up high. 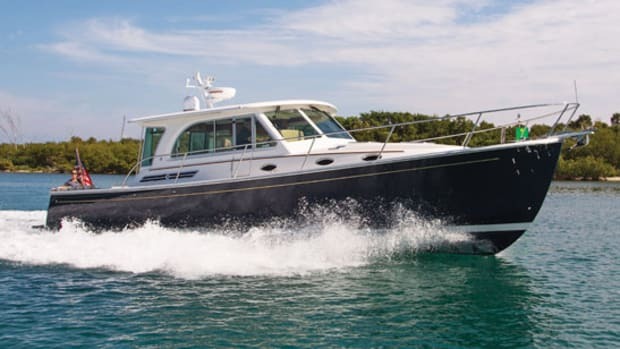 The long cockpit—think of it as a mini-dance floor at the ready—is flush with the pilothouse, which adds a lot of stowage volume below. It also eliminates the step, making a continuous, contiguous area from the cabin bulkhead to the transom. Safety-wise, Back Cove made up for the resulting lower gunwale height aft by adding a railing—nearly 29 inches above the deck—around the cockpit perimeter. A centerline transom door opens to the swim platform, which is full beam for safe and comfortable boarding from either side. A SureShade top extends out with the push of a button, protecting most of the cockpit from sun and rain. Cape Cod Canal is always fun to transit, since there is plenty to see along the way with jogging trails along the banks. Once through the Cape Cod Bay jetties, you pass Sandwich Boat Basin on the East End, then under the Sagamore and Bourne bridges, and the old Railroad bridge. Make sure to monitor VHF Channel 13 throughout the transit, (vessels over 65 feet need permission to transit, use Channel 16 and switch as directed), but as long as you draw under 32 feet you should get through unscathed. The current can run 6 knots or more, so it can take a while to get through since there are minimum transit times (which you can convert into speeds) established based on the current, and it’s a 6-nautical-mile, winding land cut. Opened in 1914, the canal shaves some 60 to 120 nautical miles off the Boston-to-New York transit. I also like going around the backside of the Cape, and tend to alternate just because Nauset Beach is satisfying to run along, and it gives me a chance to duck into Chatham Inlet if the mood strikes for a run up to Orleans and Meeting House Pond. But for this trip we took the canal, exiting past the Massachusetts Maritime Academy, out through Hog Island Channel and into Buzzards Bay. Our boat had the optional 600-horsepower 8.3-liter electronically controlled Cummins diesel. Engine control was smooth and precise. Acceleration was strong, with the boat on plane in just a few seconds. 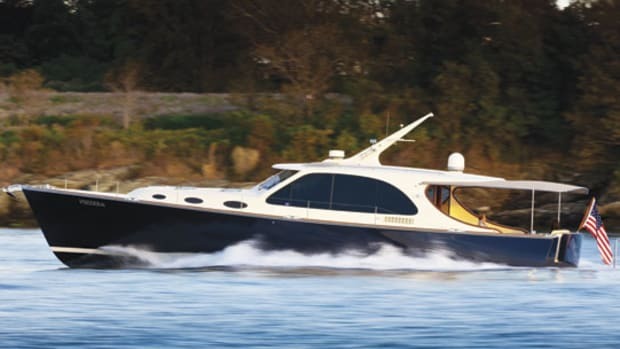 She had manual hydraulic steering with six turns lock to lock, which makes the boat less agile at low or high speeds, not at all atypical of inboard yachts. Once hard over, the boat turned well, completing a full 360-degree turn in just 30 seconds at 2400 rpm and 19 knots, which is excellent for an inboard of this size. Many take 40 to 60 seconds to accomplish the same thing. I was impressed by how little the boat slowed in the hard-rudder turn—less than 2 knots. Although stern drives and outboards tend to slow comparatively little in a turn, with the thrust being redirected, the typical inboard’s rudder adds considerable drag as it deflects thrust, and I have seen many other boats of this size slow 4 to 6 knots in the same conditions. The boat heeled nicely in a turn, just enough to send the centrifugal force down through your feet so you’re not thrown outboard, making the boat safer and more comfortable for passengers. The best test of the boat’s behavior in a head sea came in Buzzards Bay as we headed from Hog Island Channel to Woods Hole Passage. The seas were generally 3 to 4 feet, fine on the starboard bow for the most part. With my wife, who is not a rough-water enthusiast, and two small children on board, we maintained a very comfortable 17 to 18 knots and did not feel the need to slow for the occasional 5- or 6-footer. This means this 37-footer is remarkably seakindly and safe for its passengers. The interplay of wind and current in Buzzards Bay separates the men from the boys. 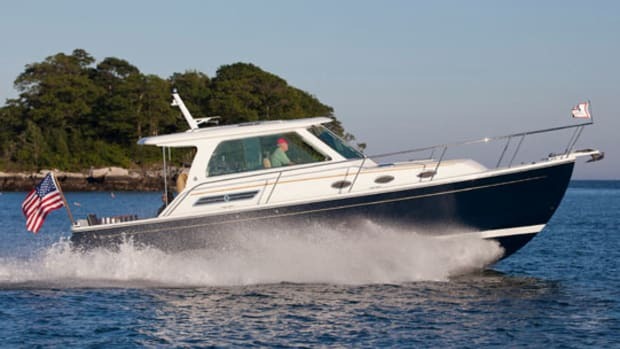 This is where a typical fat convertible or express cruiser predictably slows to a crawl and labors to make headway, while a boat like the Downeast 37 can keep up a comfortable 18 knots in 3- to 4-foot short, steep chop without comment. Just zig and zag or slow momentarily as needed and you’ll be fine in such a boat. Woods Hole Passage is much less of a problem in clear visibility than its reputation probably deserves, as long as you study the charts before entering and figure out which of the channels you’re looking at, and identify where your turns are visually—as well as on the chart and by radar—well in advance. Having your navigator help with visual identification of buoys is a huge help so you can keep much of your attention on the traffic nearby. 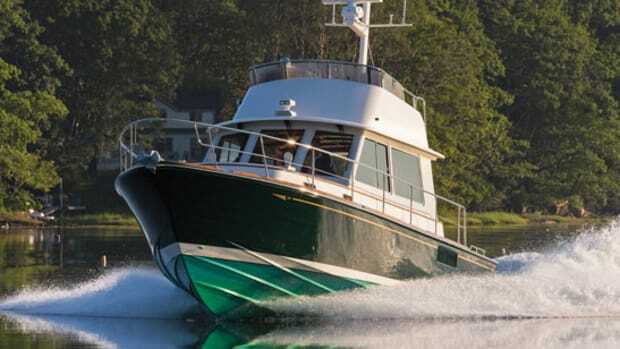 Without question, the Downeast 37—with its single prop and rudder and Side-Power bow and stern thrusters—was the easiest boat to control around the dock that I’ve run. It permits more certain and authoritative control than any pod or outboard joystick system in terms of its sheer power, precise control and responsiveness. That’s because a pod system has to use its closely spaced vectoring propellers in the stern to pull the bow from side to side, and it is working with a small lever arm—the distance of the pods from each other—against a very large lever arm—the distance from the pods to the bow of the boat. The Side-Power setup, with its proportional control (variable thrust), has the advantage of lateral thrust being applied all the way forward and all the way aft, combined with the fore and aft thrust of the prop. Thrust is applied directly in the direction you need it for any possible maneuver. Once I was close to the dock and maneuvering, I would put the rudder amidships and leave it there, and I was able to dock with absolute precision in strong wind and tide. It was so easy that I found myself joking with people who came to help with the lines. On the way from MacDougall’s in Falmouth, Massachusetts, to Newport, we pulled into Menemsha, on Martha’s Vineyard, is a quaint little harbor little changed from my days there as a Coast Guard coxswain in the mid 1970s. The Coast Guard boathouse burned down in my absence, and the docks have been modernized and expanded, but otherwise it’s the same little harbor, straight out of Norman Rockwell. In Menemsha Creek, with a strong flood tide, I turned around in a little over a boat length by backing and filling to starboard in conjunction with the thrusters pushing in opposite directions. I have never had a boat spin around so quickly and with such authority. The thrusters also have a “hold” function so the boat can be held gently against the dock indefinitely (as long as the batteries last) while lines are being handled. Adding a joystick would make it even easier, I suppose, but this would just add complexity, and it’s a fine system as is. The Downeast 37 was a far more enjoyable boat to cruise around on than the 44 MLB or 40 UTB we had at our disposal, but we had fun towing boats in that had run into trouble off Noman’s or Hens and Chickens, especially in the current and fog at night with a completely useless radar and ADF and no Loran. Ah, the memories. 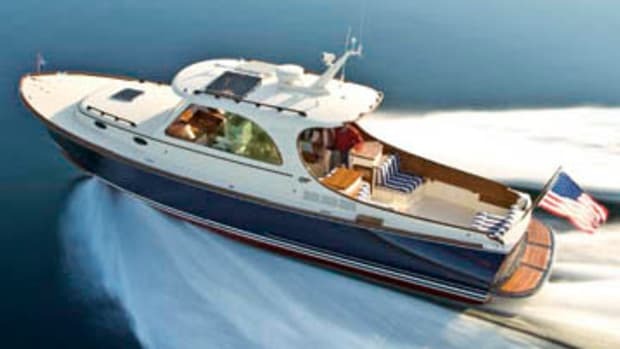 Here is a boat that will take you offshore and comfortably transit 100 miles or more in a day, putting more destinations in reach while using comparatively little fuel. She will take little effort to maintain daily or seasonally, sleep a couple comfortably, make you look like a pro around the docks and likely astonish all of those people you’ll be overtaking on a late fall day. On to Newport! Noteworthy Options: Lenco Autoglide Trim Tab leveling system w/ GPS kit ($2,150); Espar heater for cabin and helm deck ($9,950); dark blue hull ($4,540). Air temperature: 74°F; humidity: 50%; seas: 2&apos; swell, 1&apos; wind chop. 225 gal. fuel, 120 gal. water, 4 persons, 400 lb. gear.